The previous module focused on some of the physical foundations in remote sensing, this module provides an overview of some of the common groups of remote sensing platforms that are available for collecting imagery as well as some of the basic image processing routines to begin working with imagery that is acquired by such systems. This unit will conclude by reviewing some of common image band ratios and transformations that are commonly used with some of the remotely sensed imagery. The banner image at the top of this chapter are from NASA's Earth Observatory and both are showing the strength of looking at the earth from the infrared spectrum. The image on the left clearly shows the burn scares from the massive wildfire at Yellowstone National Park in 1988. The image on the right clearly shows where vegetation exists (colored in red) around Phoenix AZ, compared to more urban areas and natural, desert landscapes. These two images are excellent examples of how remote sensing can be used to monitor vegetation in the infrared spectrum in a way that the visible spectrum can not do. Panchromatic – which is black and white imagery. Digital Orthophotos – which is typically true color imagery, but has had substantial extra processing to remove various geometric anomalies such as building tilt, the geographic position of features based on changes in elevation. Digital orthophotos have also been processed to have a high quality spatial reference applied to it, which most end-users desire and expect. Multispectral – multispectral imagery is an extension of the color infrared imagery in that this imagery will typically have multiple color infrared wavelengths being collected on the sensor and/or there are some extra color wavelengths such as “Red Edge” which is a wavelength range that exists between the “red” and “infrared” part of the electromagnetic spectrum. In recent times, scientists have shown that this “red edge” band has some special spectral benefit to vegetation analysis applications. RADAR – a RADAR sensor is one that collects image data based on radio waves. RADAR sensors typically have some special ability to provide information on vegetation structure, ice, and water properties. LiDAR – a LiDAR sensor is one that collects image data based on emitting a laser beam. LiDAR sensors collect high resolution elevation data that can be useful to generate digital elevation models and to create 3D representations of objects such as buildings and tree structures. 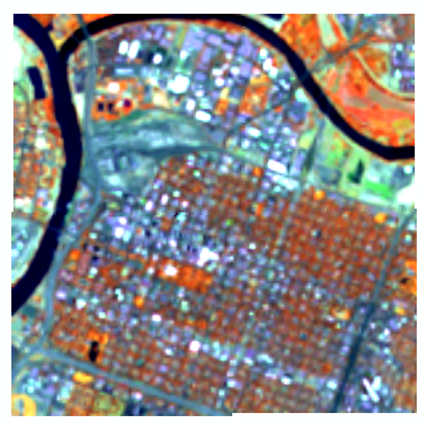 Hyperspectral – these sensors typically collect spectral information in “hundreds” of bands versus only a few (that is, 3 or 4) that are commonly found in true color or color infrared imagery. 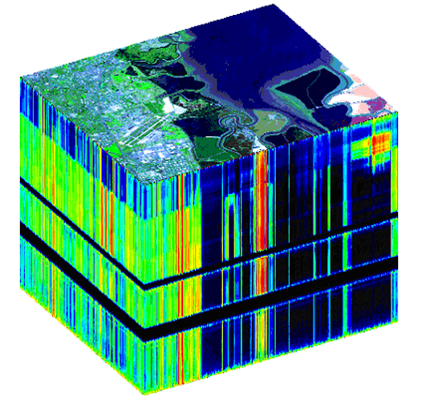 For spaceborne or satellite systems, the most widely used systems are multispectral, RADAR, and Hyperspectral. A satellite LiDAR mission called ICESAT that collected measurements on ice and vegetation heights was decommissioned in 2010 after a LiDAR sensor failure. A new satellite LiDAR mission, ICESAT-2, is planned for 2016. The following images are examples of different satellite sensors and their respective imagery. These two images above are examples of “orthophotography”. The image on the left, although is considered and orthophoto, it is not a “true” orthophoto. The image on the right shows an example of a “true” orthophoto. Notice that the buildings in the image do not have any tilt in them. 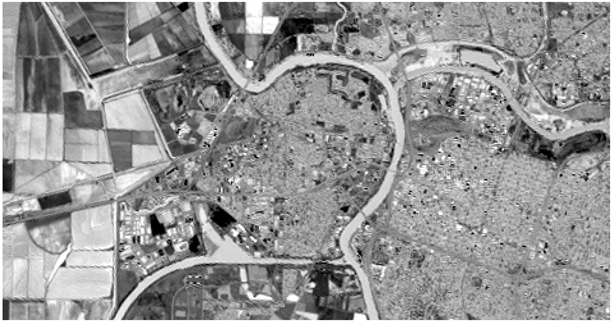 This images above shows two examples of optical satellite imagery. The term “optical” is used since many satellites use optics to resolve features on the ground. The image on the left is of a typical Landsat Themetic Mapper image of the Central Valley in California. Sacramento can be found in the lower right quadrant of the image. The image on the right is of the QuickBird satellite, which has a 2ft resolution and is the highest resolution commercially available satellite. 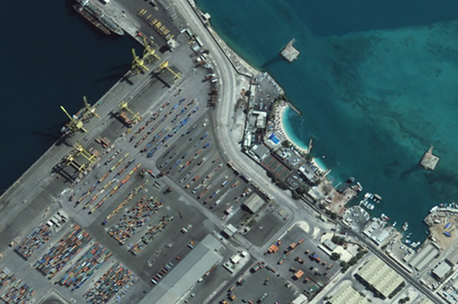 Notice in this image of the Port of Abu Dhabi in the United Arab Emirates the individual cargo containers, buildings, and cargo cranes. 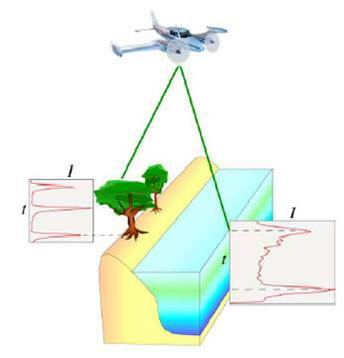 The image on the left shows an illustration of how LiDAR operates. Usually an airplane carrying a LiDAR sensor shoots a laser beam at a high pulse rate. The light beam then hits an object on the ground and the light wave is then returned to the sensor. LiDAR is used to record highly accurate elevation data and is capable of collecting the structure of objects such as trees and buildings. 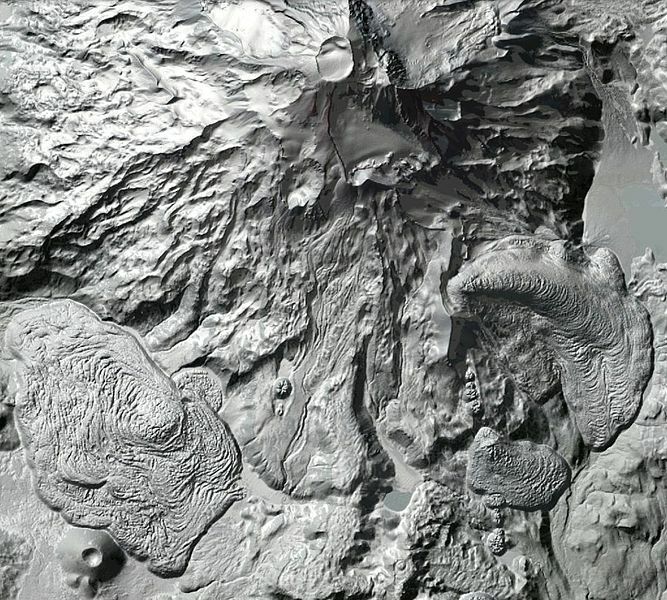 The image on the right is a LiDAR image of a volcano. Notice the intricate details of erosion, the volcanic cone, and rippling mud flows. Here are more examples of LiDAR data. 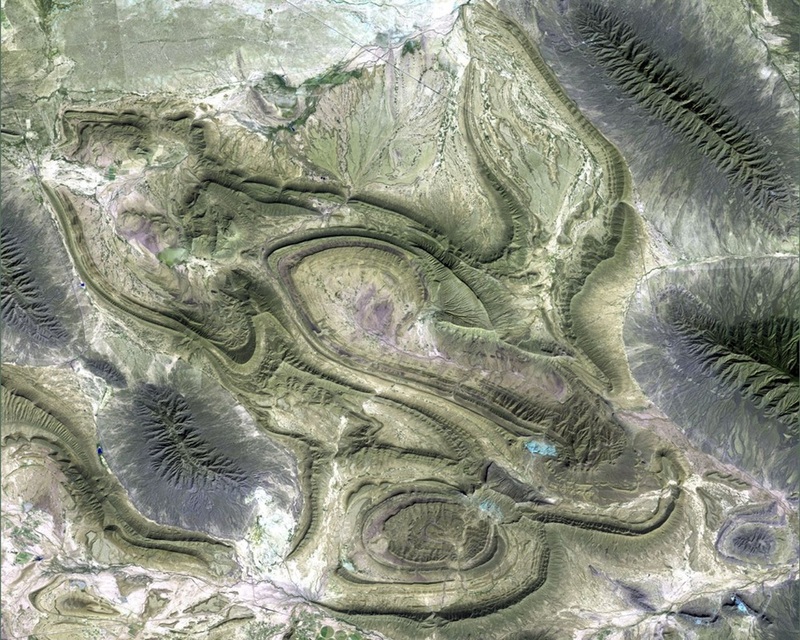 The upper left image shows a digital surface model for a portion of the Philmont Boy Scout Ranch in New Mexico. The elevation data has been draped over a hillshade layer. The small bumps in the data are actually the tops of individual shrubs. The hillshade is a derivative layer that can be created from the elevation data. A hillshade is a data layer that models shadows as if the sun were shining from a particular angle on the horizon. The hillshade layer can be used to create the appearance of a 3D effect when viewing LiDAR or other digital elevation data. The image on the upper right is an example of a 3D perspective view of elevation data. The elevation data is essentially being viewed from a different vantage point than just straight down. Again, the individual shrubs can be modeled. This view has been exaggerated to enhance the appearance of elevated terrain. The bottom image shows a profile view of a small section of the upper right image. Within the current version of ArcGIS (10.1 or greater), raw LiDAR data can be viewed with a profile tool. This tool allows for the viewing and editing of LiDAR data while working in ArcMap. This is a recent enhancement that has made raw LiDAR data more useful than with using older versions of ArcGIS. The image on the left shows a “hyperspectral cube” which is a graphic rendition that shows the dimensional of hyperspectral data. The black “bands” across the bottom of the imagery indicate parts of the electromagnetic spectrum where energy from the sun is absorbed by water vapor or atmospheric gases. In addition to these three hyperspectral sensors there are a number of private commercial companies that have started to develop, deploy, collect, and process hyperspectral data for clients. Some of these are related to mining, and monitoring the illegal cultivation of plants used in controlled substances. All of these capture imagery in dozens or hundreds of wavelengths (or bands) vs only a few that you have seen in aerial or satellite multi-spectral systems. The picture here in the middle shows an example of the Hyperion satellite image that captured an active fire in Tuscon, AZ. Now lets look at how remotely sensed imagery is acquired. In many cases, to obtain current imagery an organization must have it collected. This can be in the form of planning an aerial flight mission or tasking a satellite to perform this acquisition. In either case, the requesting organization works with a contractor or contacts the satellite distribution company directly to determine the specific requirements to obtain the imagery. For historical imagery a purchase may be required depending on the source of the imagery, licensing, and distribution requirements. For imagery that is collected through US government sources such as the federal government, state government, regional, and local governments, these may be obtained for “free” either directly from the agency that manages the data or through publicly accessible spatial data web sites. For imagery that are not purchased directly through a US firm or US subsidiary, foreign governments or agencies may need to be contacted and may have additional restrictions and requirements for obtaining and using the imagery. This slide summarizes some of the characteristics of remotely sensed imagery and may affect how the imagery is tasked, ordered, and collected. Area of coverage – often a project boundary can be provided. This is often in a GIS format. Uses of the imagery - how will the organization or project team use the imagery. Will it be used for only a background. Will the imagery be used to conduct a land cover mapping exercise that will use image processing techniques? Will other derived image sets be created such as band ratios? Repeat period – indicates how often a satellite will return to the same orbit to image the same geographic area. The repeat period can be a small number of days to more than two weeks depending on how fast the satellite is traveling, the altitude of the orbit, and if the sensor can be pointed to the same geographic location on subsequent orbits of the satellite. The images on the right show two ways satellites can image the Earth. The left image represents a satellite that travels in a polar orbit, which means the satellite orbits around the Earth and crosses both the North and South Poles. This is the most common orbital path that almost all satellites take that image the earth. The other image represents a geosynchronous orbit which means that the satellite remains in a stationary position relative to the rotation of the earth. The satellite rotates at the same velocity as the Earth so the satellite can image the same part of the earth all of the time. Many weather satellites and communications satellites are placed in geosynchronous orbits. Number of look angles – if the satellite has the capability of using multiple look angles, then this can cut down the time to acquire imagery by tasking the satellite to “look” off of center to capture the same geographic area on subsequent orbits or passes of the satellite. Number of spectral bands – how many bands does the sensor have? If there are only a few, such as true color and a single infrared band, then there may be some limitations for performing certain kinds of analyses. In the case of hyperspectral, there may be sets of bands that are of interests or can be “programmed” for use when the satellite is collecting image data. Spectral sensitivity – this also refers to the number of spectral bands and also refers to the different “ranges” of wavelengths that are captured. Most sensors use very similar wavelength ranges, but some do differ from one another. In addition there may be special wavelength ranges, such as the “red edge” that may only be found on some sensors. These will often be highlighted on satellite websites or through communication with sales or technical staff. Some optional processing and available products may be necessary or of interest to an organization or project group. These can be discussed and the need determined, depending on the scope, project, need, and budget of the project. For aerial imaging some different characteristics need to be considered when acquiring this type of imagery. Flying height – the altitude at which the plane flies. Typically, lower altitudes yield higher image resolutions, but will require more flight lines to cover a geographic area. 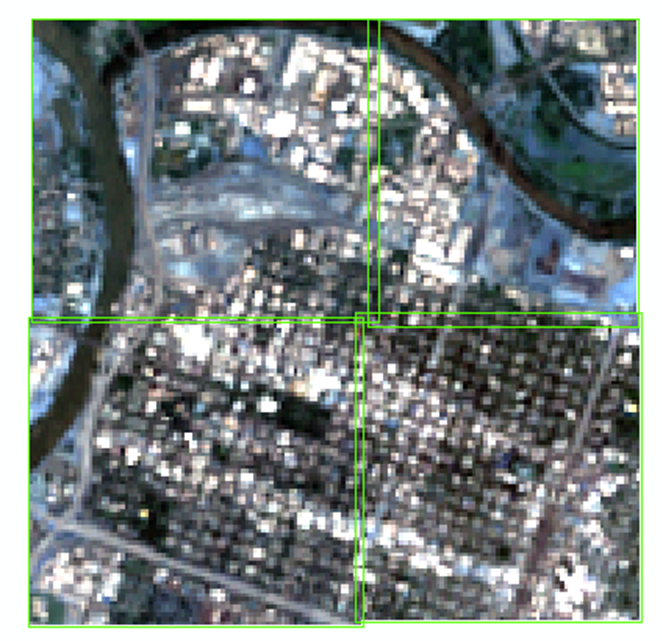 Ground resolution – the pixel size that will be recorded on an aerial image. The organization requesting the imagery will need to determine this and also balance this with the flying height, other parameters, and the overall budget for the aerial image collection. Quantity of tilt – how much building tilt will be allowed for an image collection. Areas that do do not have tall buildings, don’t have this problem. Urban and metropolitan areas that do have tall buildings, the amount of tilt can be a problem, especially if the organization is concerned with identifying features in streets or alongside walks. Tilt in an image can also be a problem when information about bridges or elevated roads need to be viewed. Tilted features in an aerial image will appear skewed or off to one side as result of the flying height and how far from the center these features appear in an image. Sun angle and shadows – obviously relates to the sun angle and shadows. If the sun angle is too low when the image was taken, longer or darker shadows can appear in the image which can obstruct other features that are found within the shadow area. Time of day – also relates to the sun angle and shadows. Typical aerial collections are acquired between 10am and 2pm since these times of the day will have high sun angles. 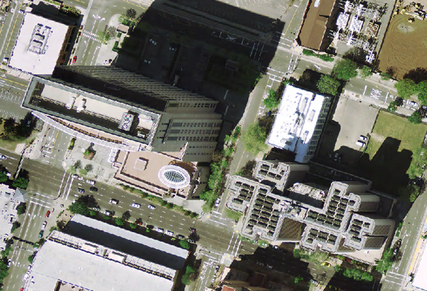 Aerial imagery taken in winter months can experience both low sun angles and long shadows and will depend in part which latitude the geographic area is located. Type of collection – is also important and can significantly increase the cost of the aerial imaging project. Sometimes a high resolution elevation surface is needed or required in addition to aerial imagery. It is often more cost effective in the long run to collect both kinds of data during one project, but collecting both elevation and aerial imagery at the same time can be more expensive compared to the cost of either data set collected by itself. A project budget needs to be developed that supports the data that is required at a specific time. Typically, once a high resolution elevation surface is collected, it may not need to be recollected during subsequent image collections. Additional LiDAR or elevation data will need to be recollected when significant changes occur in the topography (such as a result of earth quakes, floods, and mining) or when the vertical structure changes such as urban centers contain more high-rise buildings. Quantity of end and side lap – in the cases of performing edge matching, color balancing, digital elevation surface creation, and orthophoto rectification processes. The quantities can be small if ortho correction is not significantly important for making accurate measurements on lengths and areas. If a high quality image base is required, then significant end and side lap will be required. The amount of end and side lap can significantly increase the cost and needs to be balanced by available budget and overall spatial and tonal quality of the delivered image product. Satellite or aerial imagery must be ordered or have an aerial mission completed to acquire the imagery. 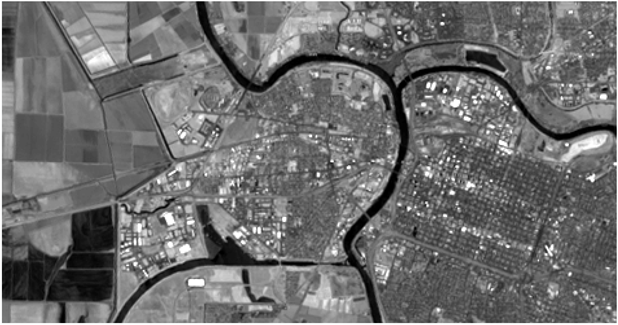 Depending on the kind of satellite or aerial imaging requirements, different methods of acquisition exist for each kind of image data set. 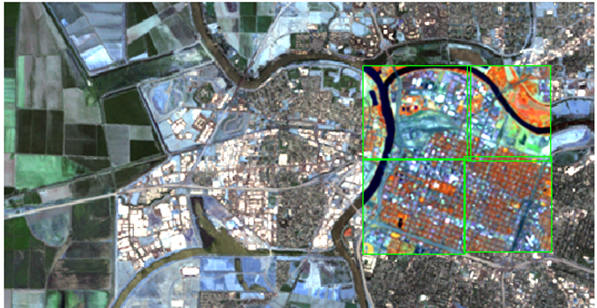 For satellite image acquisition, some of the satellites must be tasked to acquire images, since they may not be capable of continuously collecting imagery. In the case of the Landsat satellite imagery is collected in a continuous fashion and follows certain orbital paths. Images can be ordered by selecting images from specific locations along the path. In the cases where satellites must be tasked, often times an acquisition project will include the geographic location outlined by a project boundary. In addition, the requester will want to provide the maximum level of acceptable cloud cover because satellites orbit above the clouds. In addition, the time frame for collection will be needed. The project may require the imagery to be collected in a short period of time to limit significant vegetation changes throughout the project area. The collection time frame and maximum cloud cover will be balanced so that imagery can be collected in a reasonable amount of time so the rest of the image analysis project can take place within the project timeline. For aerial image acquisition some of the parameters are different since this imagery is collected on air planes that fly below cloud cover. Like satellite imagery, a project boundary is often required. A spatial reference is often provided to the image acquisition team. In addition, the image acquisition mission will collect true color imagery, color infrared imaery, multispectral imagery, and/or LiDAR depending on the specific requirements of the project and budget. Most city or local government image acquisitions collect true color imagery and may or may not include LiDAR. The LiDAR collection depends on any existing LiDAR collection and the quality of the LiDAR. If LiDAR does not exist or does not meet the requirements for the project, then additional LiDAR may be collected. Aerial image acquisitions should meet or exceed National Map and Digital Data Product Accuracy Standards. In addition, a clear understanding of “ortho corrected” vs. “true ortho correction” needs to be determined. Often times, “ortho correction” refers to the “base” features found in the imagery will be correction for its positional accuracy. Urban or metropolitan areas that include tall buildings and structures may contain building tilt in “ortho corrected” imagery. If the requesting agencies require the ability to see features between the tall buildings, then a “true ortho correction” process must be requested. This can cost more to acquire and process the imagery, but it can be worth the cost and make the imagery for valuable to the agency or agencies using the data. Often times only the area with tall buildings, structures, bridges, and overpasses require the “true ortho correction” process. The rest of the imagery can use the standard “ortho correction” process. The organization will also want to specify a pixel size for the imagery. The pixel size, will in part, determine the flying characteristics of the aerial collection and will affect the total cost of the project. Also, the mission should be planned with a “leaf on” or “leaf off” condition. Aerial collections require several month lead time to plan and schedule. For a “leaf off” condition for the Northern Hemisphere, missions will need to be funded and planned before the mid-winter (or pre-spring) months occur. Once the temperature warms and trees begin to expand their buds, the “leaf off” condition will rapidly change to a “leaf on” condition. In a similar fashion, summer collections will want to be planned and scheduled in the wintertime. Many aerial image collections occur through public agencies, so additional planning for funding based on fiscal budget cycles will also need to be considered. Imagery are typically purchased and acquired by public or private organizations. 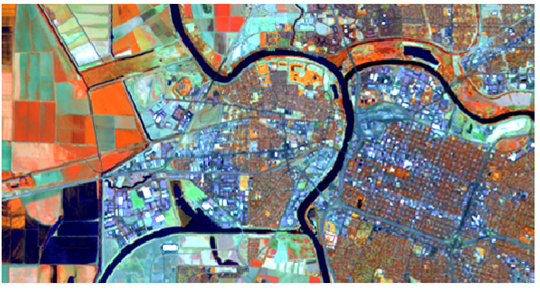 Public imagery from federal agencies could include Landsat, MODIS, and ASTER. In the case of the private organization image acquisitions occur because of the companies client needs or the organizations specific business needs. For example, an environmental consulting company may purchase imagery based on the client’s project needs. A mining or timber harvest company may purchase imagery for their own business needs of mining operations or forest management practices. In both cases, some image licensing may occur based on how the imagery is collected and data sharing and distribution policies. 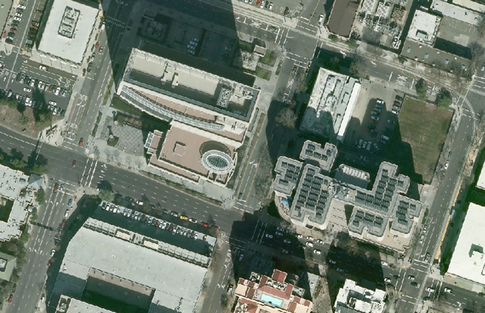 Private imagery may include agencies like DigitalGlobe. Landsat 5 image of Coahuila, Mexico. Image copyright of NASA, licensed as Public Domain. Some geographic areas may be restricted from image collected based on international agreements and laws. Image acquisition on behalf of foreign governments and private entities may have their own data sharing and distribution policies. In these cases discussions and agreements will need to occur to determine who and how imagery is used, shared, and distributed. Public domain imagery is that imagery that the general public can access “free of charge” or for nominal processing and handling fees. In the United States, since many public agencies operate on the tax contributions of the general public, much of the image data collected by these groups eventually make it to the public domain through agency websites and spatial data clearing houses. There are several imagery clearinghouses such as the USGS GLOVIS and the US Geological Survey (USGS) national map viewer where the general public can search, request, and download both image and vector data for free throughout the United States or globally. In Utah, the Automated Geographic Reference Center(AGRC) is an example of a state-wide spatial data clearinghouse that provides access to the general public for specific geospatial data. Keep in mind that that a number of months may be required to post recent public domain imagery and other spatial data sets. Now that you have an idea of how remote sensors collect image data and you have an overview of some of the major remote sensing systems, this unit provides an overview of how this data can be displayed on a computer monitor. It is important to understand the relationship between the wavelengths being captured by the system and how an analyst can use the computer to display some of this information when conducting visual analysis or for interpretation of image processing results. This slide shows the electromagnetic spectrum that was seen in the previous unit. A shown are the various wavelengths that are captured by different remote sensors. This slide shows a generic remotely sensed image. An “image” is made up of rows and columns of pixels or picture elements. For each given wavelength a separate image “band” exists. In some software packages and other literature a band is sometimes referred to as a channel, layer, raster, or grid). Nonetheless, remotely sensed imagery normally contains at least 3 bands corresponding to the Blue, Green, and Red wavelengths captured by the sensor. Other additional bands (mostly portions of the color infrared part of the spectrum are also captured on the sensor. The illustration on the right shows that an image can contain multiple bands each representing a specific wavelength that is captured by the sensor and each band is made up of rows and columns of pixels. It is common to see thousands or tens of thousands of rows and columns for a given image set. 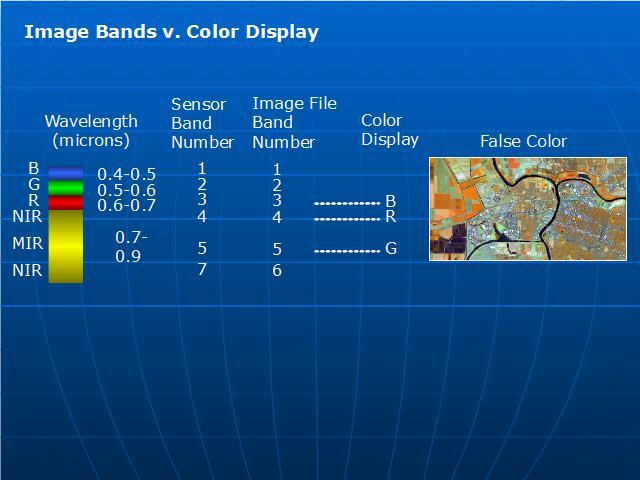 The bands can range from three, four, many, or in the case of hyperspectral imagery, dozens or hundreds of bands. For each row and column, the individual pixels contain the “information” collected by the sensor. This information is often the relative brightness value of the response for a given area on the ground. For example, an area of the earth that reflects high in the infrared wavelength will have a “large” brightness value. This large brightness value will tend to show up as a pale gray or white area in the image. Those areas that reflect less for a given wavelength will tend to appear as darker pixels on the image; hence the brightness values will be smaller. The range of brightness values depends on how many bytes can be stored in a pixel. A byte is the basic quantity of computer disk space that is needed to store values. 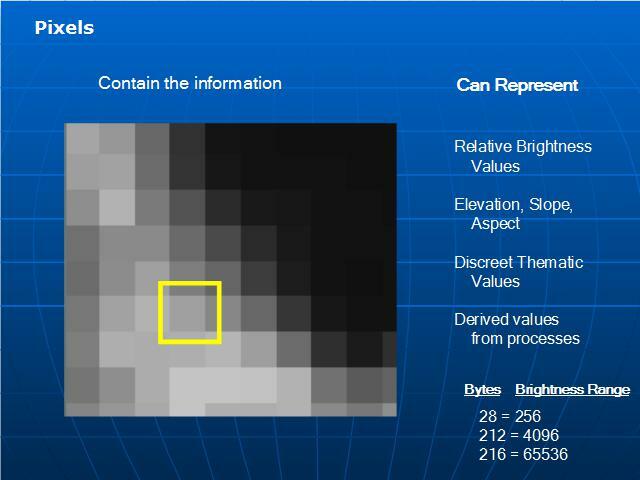 For many remotely sensed image data sets the unique brightness range values that can be collected is 256. Two hundred and fifty six values required 2 to the 8th bytes or sometimes referred to as 8-bit data. Highly reflective material will tend to have very bright pixels in the image (closer to the value 256) and material that is not very reflective for a given wavelength will tend to have brightness values closer to zero and will appear darker on the image. Two other common brightness ranges are also shown in the slide. Notice that 2 to the 12th and 2 to the 16th have much larger brightness value ranges than 8 bit data. 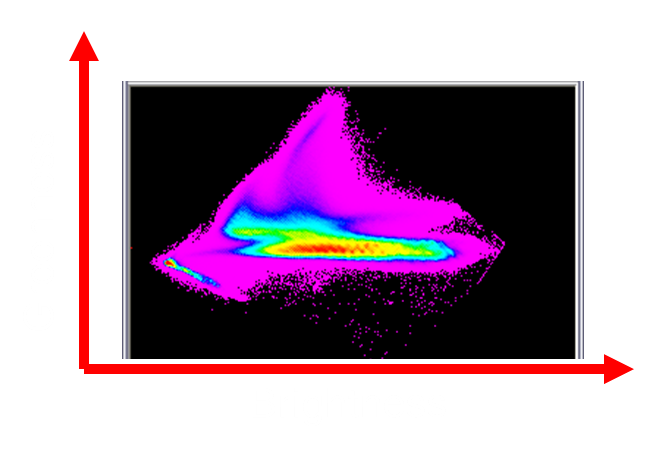 These brightness values are the numbers that are used in digital image processing routines. Later on in the course, we will use the image data sets (that include the pixels for some or all of the image bands) and create new images. The image processing routines will use the pixels values to “analyze” and then create the new data sets. Pixel values can represent other values that are not related to the reflectance of a remote sensor. Some of these can include elevation, discreet values such as unique land cover types, soil types, wetland categories, and derived values from image processing routines such as slope, aspect, and texture. This next set of images above shows each of the 6 Landsat TM bands that is collected by the Landsat satellite. 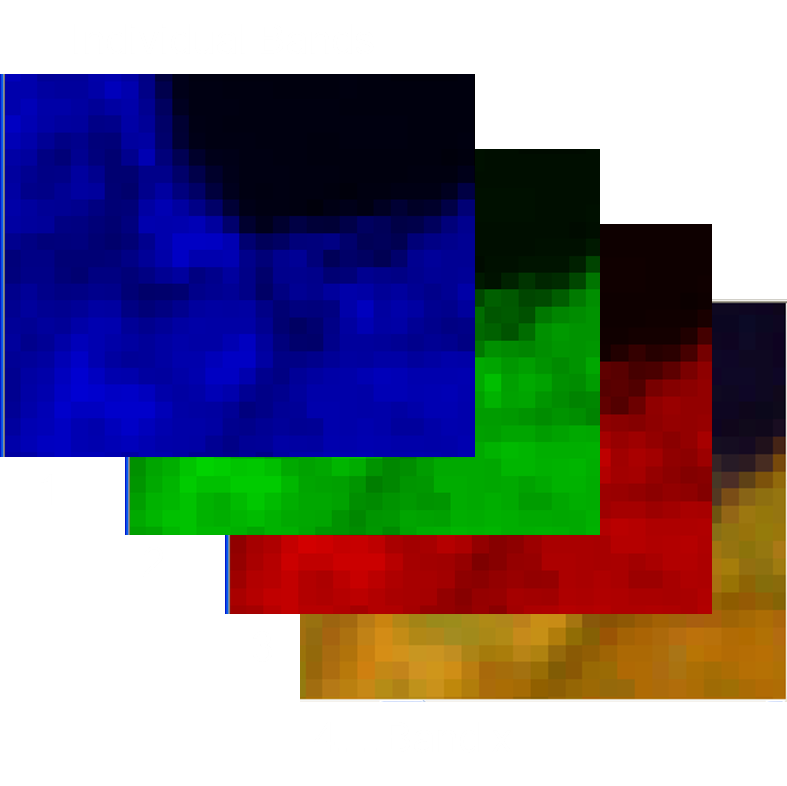 Notice that none of these are “color” since each band represents only one specific wavelength. A such, the data are viewed as a series of “gray level” pixel values. Dark pixels are those that do not reflect highly for the given wavelength, whereas the brighter pixels are those that have high reflectivity for the given wavelength. You can see for each image band that the same area does not look the same. This is because the different materials reflect differently in the various wavelengths. Remember in Unit 2 that showed the spectral curve for several major land cover types and that for any wavelength, some material reflected higher than others. 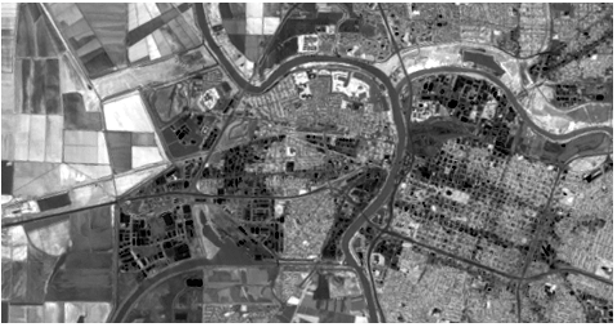 These images above shows a small section of the previous image that contains areas of agriculture, built up, and water. The spectral curve illustration is provided to remind you that different materials reflect differently in different wavelengths. Notice for the agricultural area on the left side of the image that some of the fields appear dark in the Green Band, but very bright in the color near infrared band and not so bright in the mid-infrared band, Band 5. What this indicates is that for this specific area, the field tends to not reflect highly in the green wavelength, but has a little higher reflectance in the mid infrared band (Band 5) and very high in the near infrared band (Band 4). Remember, healthy green vegetation is not highly reflective in the “green” wavelength, but much higher in the near and mid infrared wavelengths. Refer to the spectral curve graph at the bottom of this slide. So, keeping this in mind, that different materials reflect differently in different wavelengths, the next part of being able to “do something” with remotely sensed imagery is to be able to see some of this information in color on a computer screen. The way to do this is to assign one of the color display planes (which is Blue, Green, or Red) to one of the sensor bands. 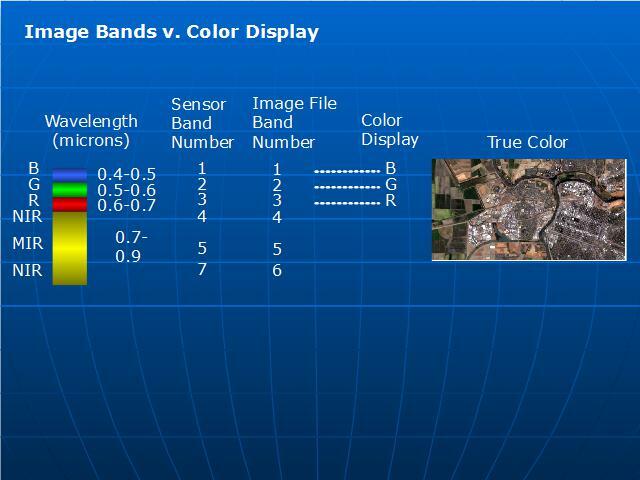 The display of the image in color results from the fact that different sensor bands reflect differently and because each band is assigned to either the Blue, Green, or Red plane of the color display. The combination of blue, green, and red computer display for a given pixel, renders each pixel in “color”. That is, for one of the image bands assigned to the Blue, Green, or Red color display, the individual pixel values for each of these image bands will have its respective brightness values shown on one of the color planes. The combination of these pixel values that are displayed on the Blue, Green, or Red color monitor will show up as some “color”. The illustration at the bottom left of the image above shows a specific pixel in the image. The sensor bands Blue, Green, and Red are assigned to the color display as Blue sensor band being assigned to the Blue color display, the Green sensor band being assigned the Green color display, and the Red sensor band being assigned the Red color display. The Red color display shows the Red sensor band brightness value of 70. The Green color display shows the Green sensor band brightness value of 75. The Blue color display shows the Blue sensor band brightness value of 85. This color combination yields the greenish-brown or olive colored pixel. Since all of the brightness values are no really high, then this pixel tends to appear darker than those pixels with a higher pixel value. 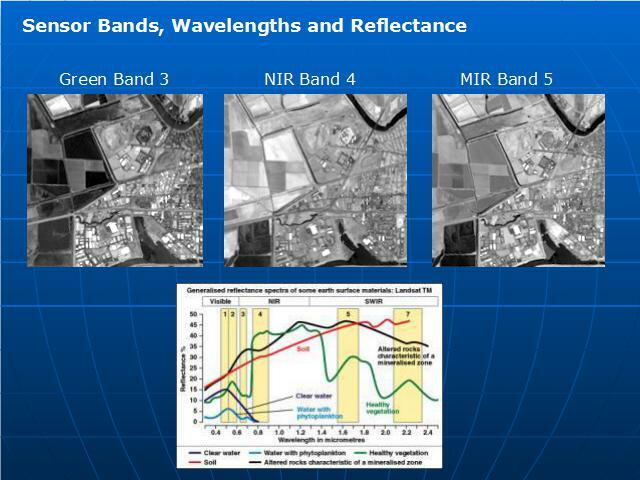 The image shows the wavelengths that are assigned to the respective sensor bands (in this case or the Landsat satellite). 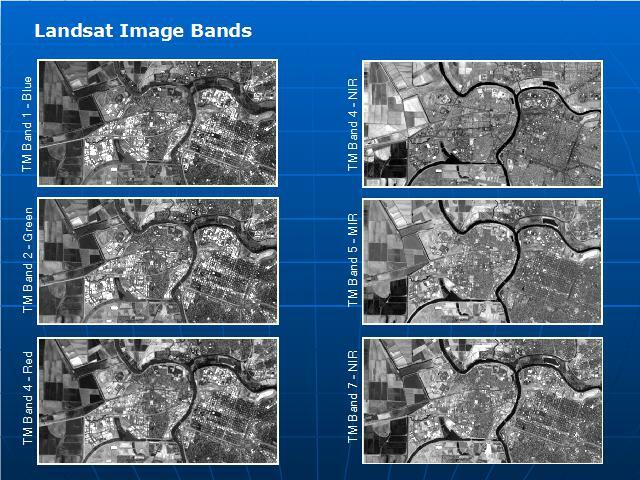 For Landsat, since there are 6 commonly used wavelengths and thus, a six-band image is used by an image analyst. Since not all bands can be viewed at one time, up to three of these bands can be assigned to different color planes on the computer monitor. Depending on which three bands are assigned to the different color planes, the remotely sensed image can viewed with different colors and tones. This “Band Combination” is referred to as a “False Color Infrared” image. For vegetation mapping and analysis applications that use a single color infrared band, this band combination is typically used for color display. This image shows a different false color image display that has the Red sensor band (Band 3) assigned to the Blue color display, the Near infrared sensor band (Band 4) displayed as Red, and the Mid infrared sensor band (Band 5) assigned to Green. Notice that vegetation typically appears as tones of orange, urban areas appear bluish gray, and non-vegetation, bare areas appear a light green. This is another band combination that is typically used with Landsat data by analysts conducting vegetation analysis or land cover mapping. The benefit of this band combination is that two of the infrared wavelengths are being assigned a color display and is a way to maximize the “information content” collected by the sensor so that humans can “see” the reflectivity of the infrared wavelengths through the use of the color monitor. 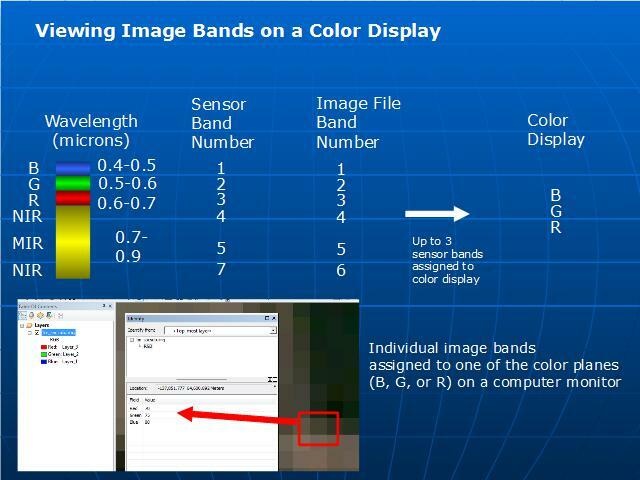 This slide shows another “false color” band combination where the Green sensor band (Band 2) is assigned to the Blue color display, the Mid infrared band (Band 5) is assigned to the Red color display and the Near infrared band (Band 6) is assigned to the Green color display. So any 3 sensor bands can be used to assign to the Blue, Green, and Red color displays and it does not always have to be the three true color bands. The band combination that is used depends on what kinds of visual interpretation is needed and if the analyst wants or needs to see the infrared data on screen. Lets now consider looking some basic functionality of some common image “pre-processing” functions including: image composition, image subset, image mosaics, and image stretching. 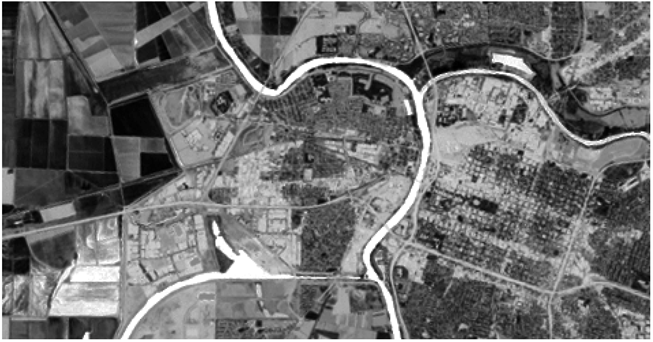 Some of the common functions that are used by image analysts before getting started with other image processing routines are to piece together an image from individual sensor bands, create an image subset based on a project boundary, or to merge a number of adjacent images into a single image. These routines can be thought of as “pre-processing” steps that an image analyst might have to use before performing other image analysis. Image composition is the ability to combine individual image bands together to generate a single image. This routine is often used in the raw image is provided as separate image band files or if the analyst obtains individual bands from spatial data clearinghouses. The essential task is to combine each image band in the wavelength order that it was collected in. For example, typically multispectral imagery is ordered by shortest wavelength to longest wavelength. In most cases, image band 1 will be the blue wavelength sensor band, image band 2 will be the green wavelength, image band 3 will be the red wavelength, and image band 4 will be a near infrared wavelength. If other sensor bands exist, then they will follow the specific band order as indicated by the satellite vendor or the air photo collection platform or sensor. The result of the image composition routine is a single multispectral image. Clipped image subset. The white areas of the image is essentially non data or the area that will not be processed with subsequent routines. Image subset is a method of clipping out an area from a single image. For example a specific geographic project area of interest may exist within the image. Using a project boundary or the viewing area of the image window, a smaller image can be “cut out” of the image. This can be useful to trim down the image size and can also help speed up the image processing tasks since only a portion of an image is being analyzed versus the full geographic extent of the image. Typical methods to subset an image are a rectangle, a polygon, or an image mask. An image mask is an image that contains only one pixel value and thus can be used as a data set to extract geographic areas from other image data sets. 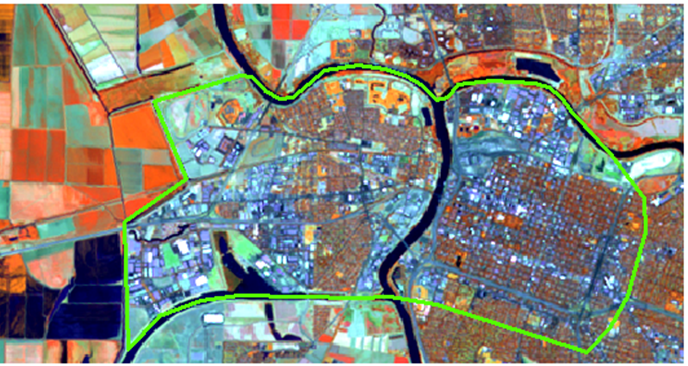 As shown in this slide the upper left image shows the full extent of the image and a project boundary that is shown as a green outline. Another routine that might be useful when processing imagery is to merge adjacent images together, called image mosaic. Typically, the adjacent images are overlapping and are of the same or near the same date of collection. Ideally, an image mosaic will have a seamless and color balanced appearance. This will occur when the neighboring images have the same date and were collected close to the same time and have similar collection characteristics (such as the same flying height and camera angle parameters). If these conditions are not met, then an image mosaic may have a mix of different color tones and the features within the image may have the appearance of having different image collection angles. That is, a tall building may be viewed with multiple perspectives vs one perspective or a straight down appearance. Image stretching is mentioned here, since this is a way to modify the visual appearance of an image and make it more visually interpretable by the analyst. In many cases these days with image processing and GIS software, when an image is loaded into a viewing display, the image will open and look a certain way. For the most part the images will tend to look just fine. In some cases, the images may appear kind of hazy, or grey, or have a brownish tint to them. Part of this may be a result of the kind of image stretch performed on the image as it is being loaded into an image viewer. If an image does not look real appealing, then an image stretch can be performed on it. In the case of ArcGIS there are a number of options that can be used and the appearance of the image can be manipulated by the user in a customized fashion by modifying the histograms of an image. When an image is stretched, the original pixel values get redistributed across a specific brightness range. The brightness range depends on how many unique values are available for a given image band. In many cases the unique range of brightness values is 256 or what is referred to as 8-bit data. As mentioned in an earlier unit, the number of bytes that can be stored in an image band determines its brightness range. When an image is stretched, using a variety of techniques, the appearance of the image can improve. Histograms represent the pixel count and distribution of unique pixel values or brightness values in a given image band. 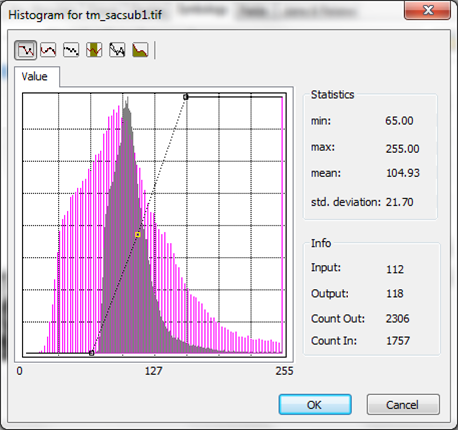 The histograms are created by computing the image statistics for each band. 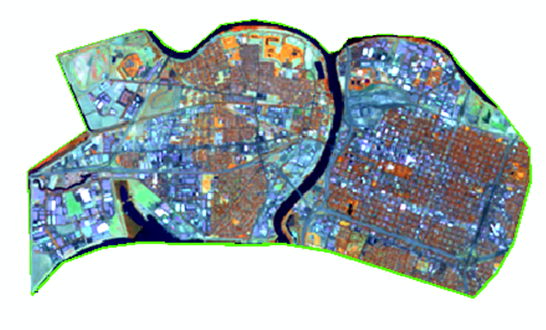 This is performed in many remote sensing and mapping programs when the image is loaded and the program does not detect pre-computed image statistics. In some cases a tool may exist to compute the statistics. This would need to be completed before performing the image stretch. Once histograms are created, it can be pulled up to provide a graphical display of the pixel count and distribution of pixels. In the histogram image above, the distribution of the original unstretched data is shown in gray and the stretched distribution is shown in pink. Notice that there are gaps in the pink distribution. This is because some of the original brightness values were repartitioned to different brightness values. Also note that the brightness range for the original is smaller than the pink brightness value range. This means that the original image would have less contrast while the stretched version would have more contrast and appear to have more visually distinctive features. The analyst can also move the controls found in the histogram around and change the resulting stretch of an image. Most often one of the provided image stretching choices is used versus using a customized stretch. Typical options for image stretching that can be found in most image processing software packages are: standard deviation, linear or min-max, and histogram equalization. The most commonly used stretch is the standard deviation, since this stretch seems to provide an image display with a good contrast among all of the features within the image. Users are encouraged to consult software help to discover more details about these image stretching types. Essentially, each of these image stretching methods use statistics and mathematics to compute new distributions of brightness values that then get applied to the imagery when it is displayed in an image viewer. In this final section, we will focus on a couple of common image processing routines that are often used with image analysis called band ratios and transformations. Remote sensors collect image data across different geographies irrespective of the sun angle, the elevation, slope or how steep a hill is, or aspect, the direction the slope is facing, or how variable different kinds of materials occur across the image. In a geographic landscape the same kinds of vegetation can occur across different slopes, aspects, elevations, and will grow with different amounts of sunlight hits it. From an imaging point of view, this same material may look different on the image based on these different perspectives. This can make image analysis, and especially automated processes to identify vegetation, difficult. One way to help mitigate this problem is to use band ratios. Band ratios can help normalize these effects and can help improve automated image classification processes. In addition, band ratios can be implemented to derive various biophysical properties from the imagery such as the quantity of biomass, water content, and plant stress to name a few. As the name indicates a band ratio essentially takes the values from one band and divides it by the values of another band. Since all of the pixels in a given image are coincident, the math to perform a band ratio is relatively simple. A couple of common band ratios are shown. Typically, the Blue, Green, and Red bands essentially have the same “informational content” in them, so ratios of Blue to Green or Green to Red or Blue to Red are not common. What is more common is taking a ratio of the Infrared wavelength to the red wavelength. Remember that oftentimes, remotely sensed imagery is used for vegetation and natural resource applications and the infrared wavelengths tend to reflect much higher than the true color bands. These kinds of ratios can be important to assist with vegetation analysis. In the case of the Red band being divided by the infrared band, vegetation is going to reflect much lower in the red wavelength and much higher in the infrared wavelength. Performing this ratio, materials that low in red, but high in infrared, the resulting image will show these areas as dark. The values in the ratio will have a small numerator and large denominator. Performing the math, the result will be a small number. In terms of the image, these areas will appear dark. For example, healthy green vegetation reflects low in red, but high in infrared. Doing the Red to infrared ratio, the resulting pixel values will be small and hence appear dark on the image. The image in the slide shows agricultural areas towards the left side of the image as dark. These areas have healthy green vegetation that are fertilized and watered, but because they reflect higher in the infrared wavelengths than in the red wavelengths, they appear dark on the image. Another popular ratio is called the Normalized Difference Vegetation Index or NDVI. This ratio is a combination of taking the difference of the infrared and subtracting the red and dividing it by the sum of the infrared and red bands. This ratio is very good about identifying where the healthy green vegetation is and to also show areas that may be under different kinds of plant stress. The stress may come from drought conditions, beetle infestation, plant diseases, poor soil, fire and heat, and other influences. Other specific kinds of ratios are related to soil moisture, agricultural stress, and forest health. 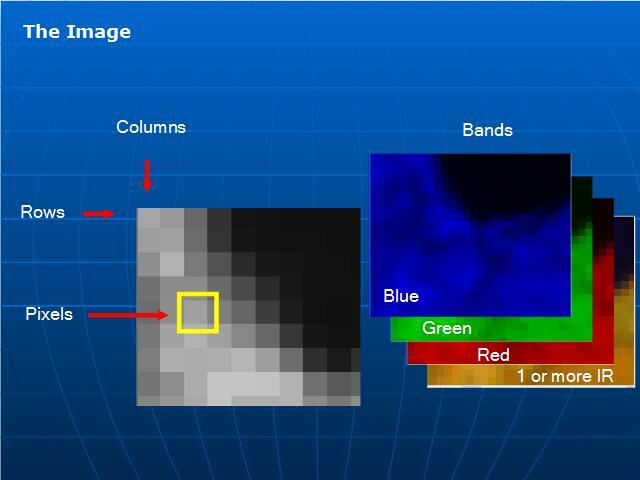 Students are encouraged to investigate other resources online or in other text books that discuss image processing and image enhancements using band ratios. This images above show a couple of different ways software programs can represents the NDVI output. 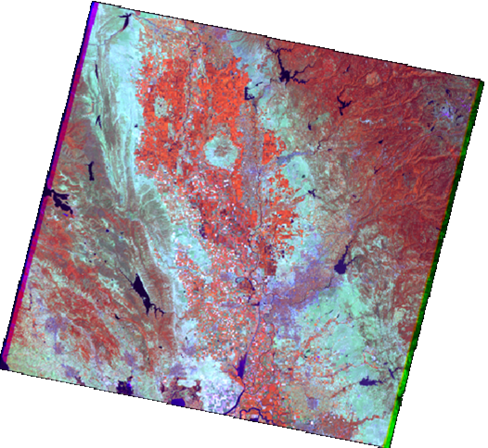 In the same NDVI image on the left, the colors in green represent areas that have a high NDVI value. Those with shades of light orange and yellow to a light brown are areas that have little or no healthy green vegetation. Sometime this kind of display can be confusing because the analyst may not be aware of which colors represent small NDVI values and may think that the output image contains multiple bands, when in fact, the NDVI contains only a single band. The NDVI image on the right shows how NDVI is represented in a variety of software packages. The image is a gray-scale image indicating that it is a single band image. Looking at the NDVI algorithm one can determine that the larger the difference there is between a large infrared value and a small red value, the brighter the resulting NDVI values. A large difference in infrared and red values will result in a larger positive number in the numerator. 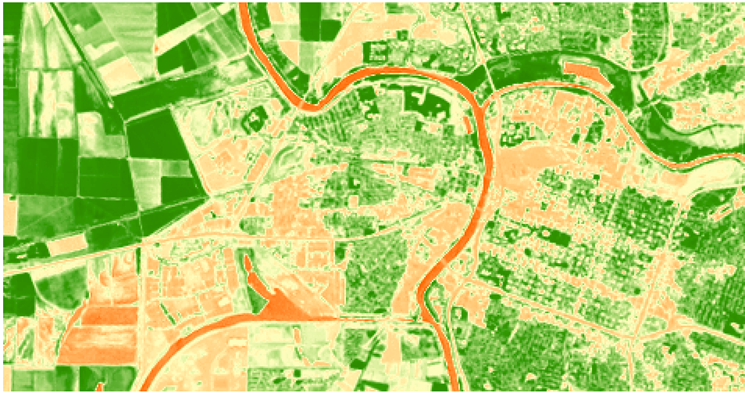 In the case of healthy green vegetation, these areas will show up as brighter pixels. Notice the bright areas in the agricultural field in the left side of the bottom image. If the opposite occurs where there is a small infrared value (for example, water) and a larger red value in the numerator, then the resulting NDVI will be smaller (or even negative) and the image will appear dark. For example, in areas of where there is standing water, infrared wavelengths essentially are zero because water absorbs infrared wavelengths. Also in the black and white image areas that contain vegetation appear a brigher shades of gray or white. One can see that on the lower right of the bottom image that there are extensive light gray areas which in this case represent tall deciduous trees that are well maintained in an urban environment. 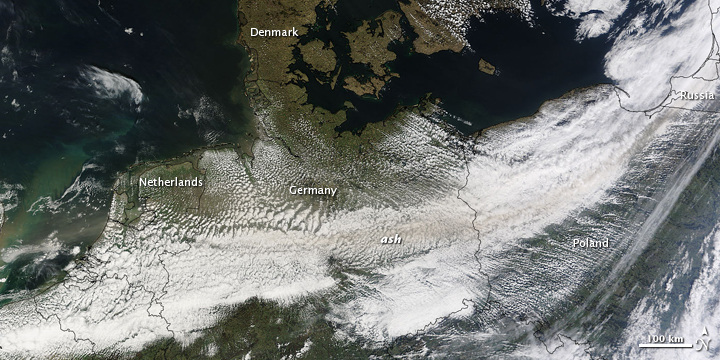 The darker gray areas are typically commercial buildings, built up, or bare soil. The name tasseled cap comes from the shape that occurs when two different resulting tasseled cap components are plotted against each other. In the illustration on this slide, the pixel distribution of the brightness band is plotted against the greenness band distribution. Note the pointedness of the graph and looks like a tassel on a cap. If you remember back to the previous unit, each image band has a distribution of pixels. If the distribution of pixels were plotted, there would appear a range of brightness values and some of those pixels would occur more frequently throughout the image than others. Shown in this slide are the individual Brightness and Greenness bands plotted separately. Notice the large peaks on each graph. These are brightness values that have larger pixel counts than other brightness values. If the analyst was able to plot the combination of the brightness value and the greenness value for each pixel, the output would look similar to that in the previous slide. The images above shows the individual Tasseled Cap components that are derived from the Tasseled Cap routine for a small portion of a Landsat TM scene. The image on the right shows a gray scale image where brighter values represent areas in the image that appear as bright objects. In this image, these would represent buildings, dry bare soil, and industrial areas. Darker areas will represent areas that tend to NOT be bright, so this will include much of the vegetated areas or have tree canopy above residential areas or pavement in this image. The middle image represents the greenness component. Brighter values in this image will represent areas that are healthy green vegetation. Darker values will tend to NOT be green vegetation or have mixed pixels that are not vegetation. The image on the right represents the wetness component. Bright areas will represent areas that have either open water or strong water content responses. The rivers and vegetation show up brighter throughout this image because the vegetation contains a lot of water content within its leaves. Dark areas will represent urban or build up areas that do not have any vegetation canopy covering it. Mid-gray level values will be those areas of bare soil that may be damp or have some small vegetation growing on it such as newly planted fields or low lying areas with sporadic vegetation scattered throughout it.